On Wednesday, September 28th, Drago Centro celebrates the launch of its Fall Cocktail Menu with special $8 pricing on the new drinks (normally priced at $12). 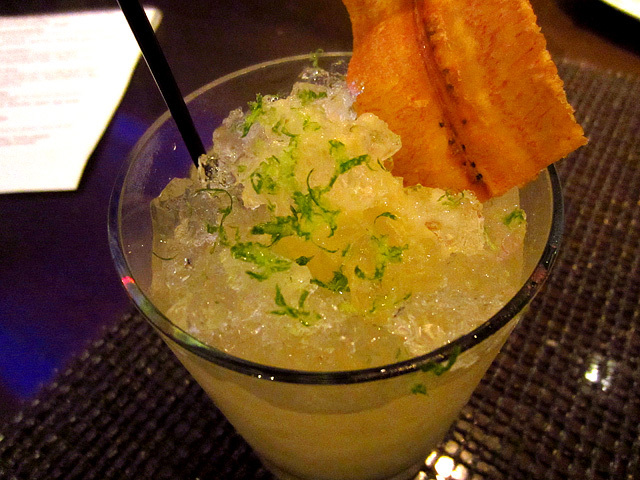 The restaurant’s previous seasonal cocktail menus were collaborations between Beverage Director Michael Shearin and Head Bartender Jaymee Mandeville. With the exception of one cocktail, all of the drinks on the latest menu of Nuovi Classici (“New Classics”) were created by Mandeville. At a hosted preview of the fall cocktails, Shearin explained the reason behind this change: he’s accepted a position with Young’s Market Company as Division Wine Manager, and his last day at Drago Centro is on Friday, September 30th. Shearin isn’t moving on from the Celestino Drago Group completely, however; he’ll continue to offer his expertise as a Consulting Beverage Director. Shearin’s former position has now been split into two jobs, with Mandeville as Drago Centro’s new Bar Manager, while a new hire will oversee the stellar wine list that Shearin has built. One thing that hasn’t changed is the cocktail menu’s emphasis on balance and fresh, seasonal ingredients. As with other previews, Mandeville mixed each drink in the order it’s listed on the menu, and then presented it with some insight into the creative process. Shearin once again had fun with the drink names and backstories. Any guesses as to which cocktail was named by Mandeville? The tasting started with A Penny’s Worth: Hayman’s Old Tom Gin, Plymouth Sloe Gin, Crème de Violette, oregano and Fever Tree Tonic. 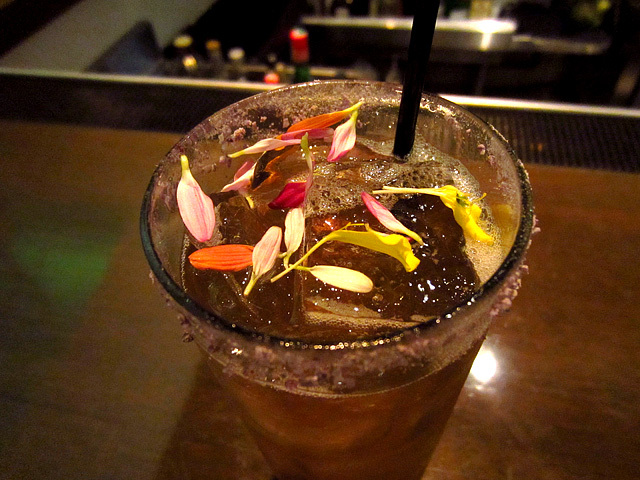 The tall glass is rimmed with crushed violet candy, and edible flowers provide a colorful garnish. Mandeville’s refreshing take on a Gin & Tonic deftly brings that summer staple into the balmy LA fall. 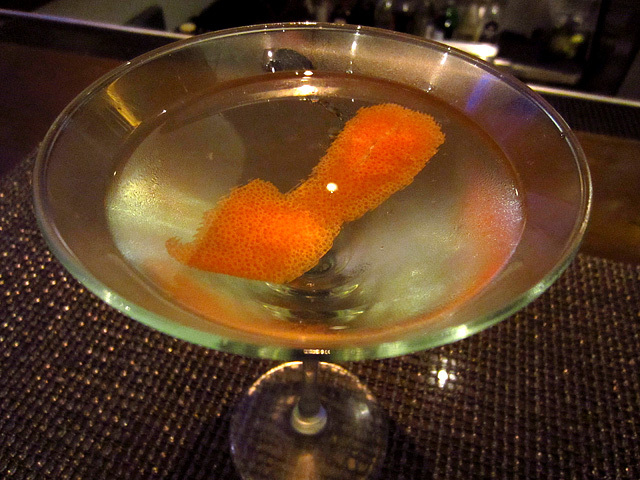 The cocktail’s name refers to a custom from the Gin Craze of 18th century London. Pubs would often have a wooden plaque shaped like a black cat (an “Old Tom”) mounted outside on a wall. Pedestrians deposited a penny in the cat’s mouth, and a bartender inside the pub served a shot of gin to the customer through a tube between the cat’s paws. Next was the Blessed Bliss: Karlsson’s Vodka, Cardamaro, Underberg Bitters, fresh ginger, fresh apple, torched rosemary sprig. 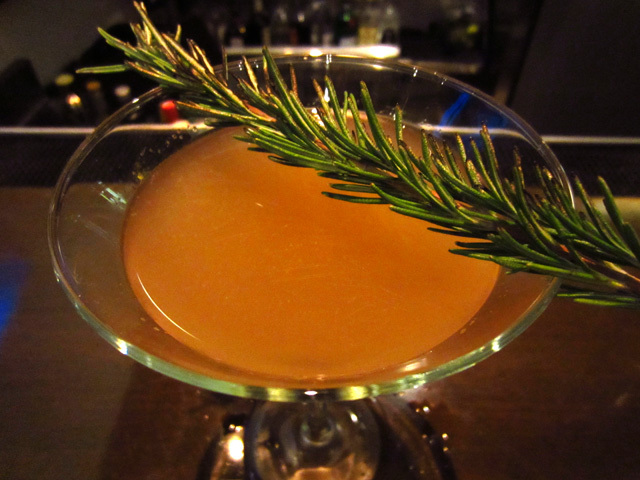 The smoldering rosemary adds a wonderful seasonal element to the drink experience. Mandeville noted that Drago Centro has featured a vodka drink every season, and in the same way that I was pleasantly surprised by the Spring Menu’s Orange Blossom Special, the Blessed Bliss caught my attention and kept it with each sip. Cardamaro is an amaro from Italy’s Piemonte region, and one of its botanicals is blessed thistle, hence the cocktail’s name. Mandeville fired up the next cocktail, the Hot Bellied .45: Bulleit Bourbon, Del Maguey Vida Mezcal, Cocchi Americano, SNAP, Fee Bros. 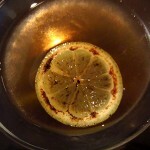 Lemon Bitters, garnished with a torched lemon wheel. Even before tasting it, I knew I would enjoy the Hot Bellied .45, and sure enough the mix of spice, smoke and sweetness is a winner. Can’t wait to reload with this one. 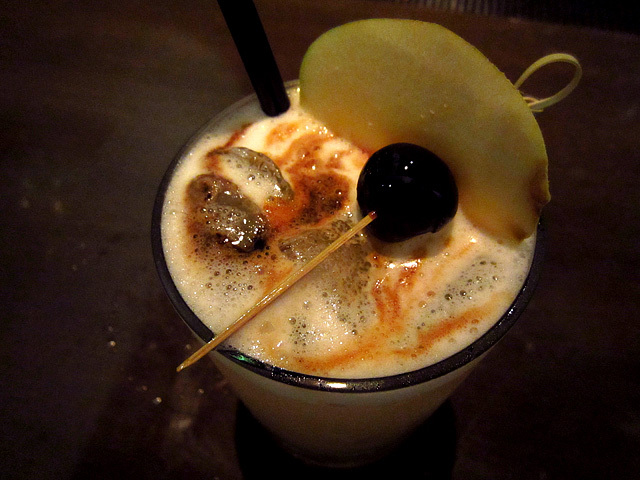 You know you’re in for an interesting cocktail when it’s named for a discarded Phish track, and the Lushington delivers: rye, quince gastrique, egg white and a drizzle of 25-year aged balsamic vinegar. 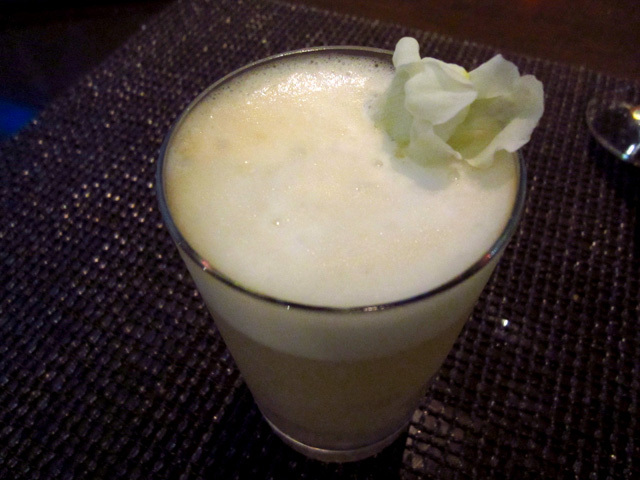 Mandeville’s unique take on a whiskey sour is a standout, with layers of flavor and texture that develop as the drink opens up. 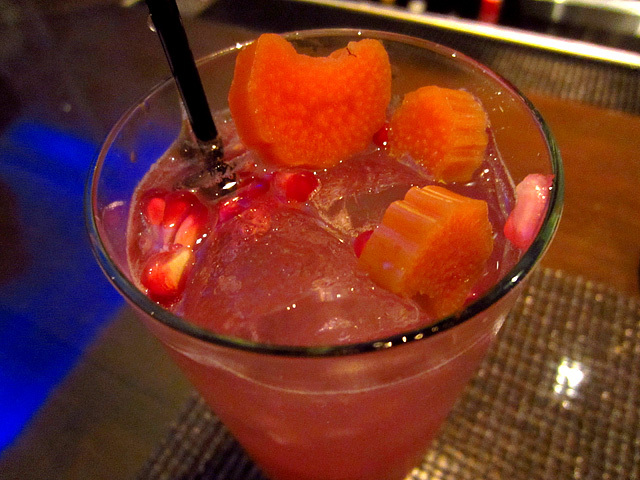 She noted that quince is just coming into season, so the drink will evolve in the weeks ahead. If you guessed that the No Place Like Home (Campo de Encanto Pisco, Rhuby, fresh lemon juice, fresh aloe, fresh pomegranate arils) was named in tribute to Dorothy’s ruby slippers from The Wizard of Oz, you’d be partially right. This eye-catching cocktail features Rhuby, the new release from Art in the Age, based on a garden tea made by John Bartram after Benjamin Franklin sent him America’s first rhubarb seeds. 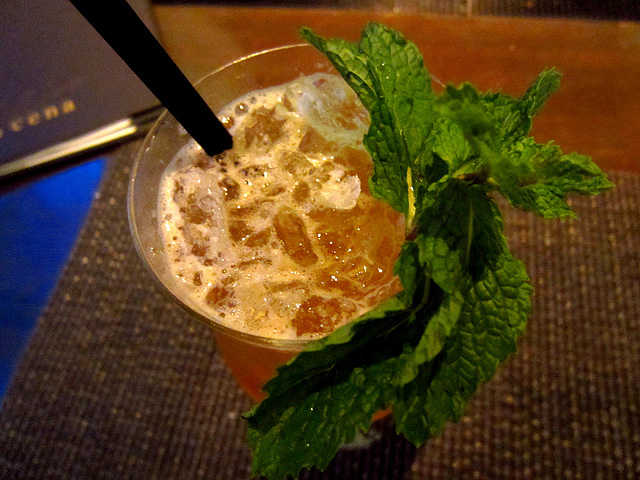 Sip this tall drink on Drago Centro’s patio, and you’ll think there’s no place like Bartram’s Garden. The Organized Konfusion is made with Tanteo Cocoa Infused Tequila, fresh banana, fresh lime and an Espelette pepper tincture, garnished with a banana chip. It’s a subtle visit to the tropics, with a mildly spicy finish. Tanteo is Spanish for “inaccurate pour,” and the inspiration for the cocktail’s name, which happens to be the same as the acclaimed 90’s underground hip hop duo. Scottish Cashmere is considered to be the softest, smoothest and finest in the world. 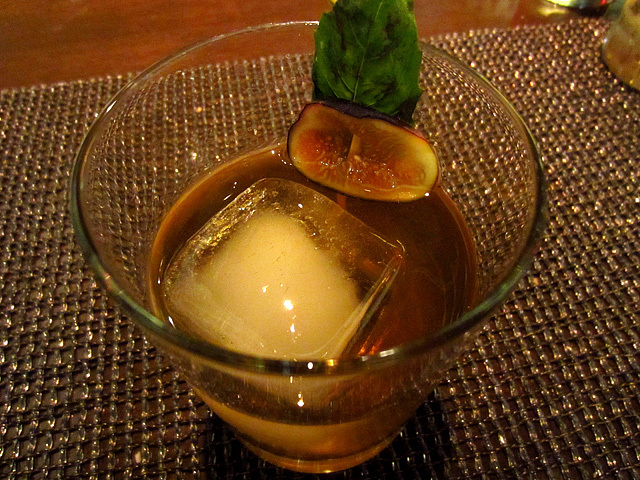 And the cocktail does its namesake proud: Highland Park 12-Year Scotch, fig and basil-infused water, and a single ice cube make for a sublime drink ideally suited for those crisper fall nights that really do exist in LA. Mandeville said to think of the fig and basil like cashmere, the accessory that enhances, softens and smooths the Scotch. 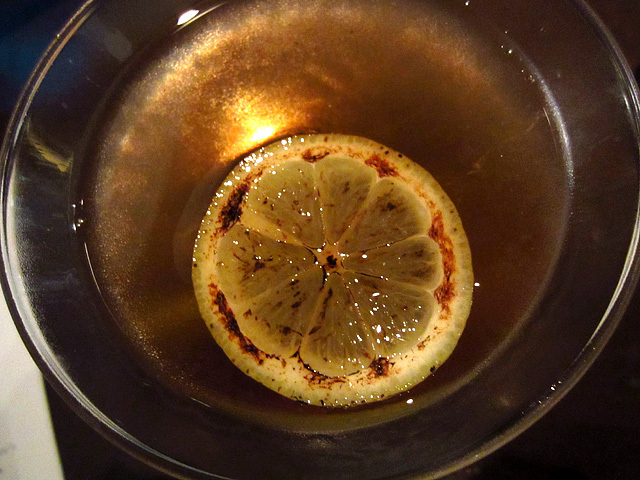 Drago Centro’s Tiki drinks always have a reference to the Pirates of the Caribbean movies, and for the fall Mandeville offers the Song of the Siren: Appleton VX Rum, Cruzan Blackstrap Rum, Amaro Cio Ciara, Velvet Falernum, Apry, Sour Cherry Bitters and fresh lime. This libation probably won’t lure you to your doom, but it will definitely transport you to a tropical paradise. Mandeville mashed up the Ramos Gin Fizz and the Last Word to create the White After Labor Day: Nolet’s Silver Dry Gin, Green Chartreuse, fresh lemon juice, lavender water, egg white, Fernet Branca mist. The remarkably pale color refers to the old adage about not wearing white after Labor Day. Its very unique flavor profile is yet another Mandeville creation that rewards with different notes in each sip. Sadly, I wasn’t able to get a spray of Fernet by itself. Pinzimonio: the drink that eats like a meal. 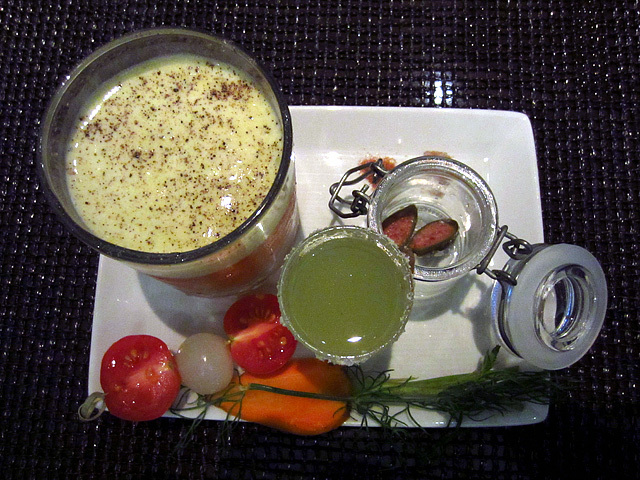 In a rocks glass: Jacopo Poli Grappa, fresh tomato, fresh orange, olive oil foam. In a shot glass: Hangar One Vodka, cucumber water, fresh pepper, fresh basil. The drinks are accompanied by skewered cherry tomatoes and a cocktail onion, a canning jar with caper berries, and pinches of Hawaiian and hickory smoked salt. At $18, the Pinzimonio is the most expensive offering on the new menu, but you definitely get your money’s worth: a deconstructed Northern Italian dish that’s two cocktails in one, and more. The fun part is experimenting with the flavors, sips and bites. I started with a taste of the grappa drink, nibbled on a caper berry, then sprinkled some salt into the shot before taking a sip. Then I ate a cherry tomato and pretty much destroyed the dish after that. For those with a little more self-control, there are possibilities galore. Best of all, Ferdinandi said the Pinzimonio tasted exactly like the dish he remembered. The Pinzimonio was a fitting conclusion to the tasting, from its culinary inspiration, to the high quality ingredients and execution, to the playful and interactive nature of its presentation. The Pinzimonio is a final collaboration that displays all the strengths of the bar program that Shearin and Mandeville have created, and the future is bright indeed as each of them moves into the next phase of their respective careers.